In a flash of a stroke... lashes look up to 60% longer, defined lash by lash. Do you want longer-looking, more defined lashes in just one step? It's possible with the fantastic new Telescopic mascara from L'Oréal Paris! 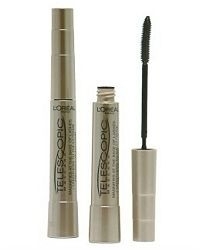 The high-precision flexible brush stretches the formula towards infinity for lashes that look up to 60% longer. The brush edges separate the lashes with precision for intensity lash by lash. Quick and easy to apply in just one step, with virtually no clumping. Great application brush which separates lashes. Lengthens lashes without clumping. Nice long thin tube, and seemed to last a few hours without flaking off but not all day. You probably need already good lashes before using this product. "When I first saw this mascara I was sold by the quirky packaging. The tube resembles a telescope and it claimed to lengthen and volumise..."